a dental prosthesis that restores one or more, but not all, of the natural teeth or associated parts and that is supported by the teeth or the mucosa; it may be removable or fixed. a dental prosthesis, either fixed or removable, used to replace one or more missing teeth. 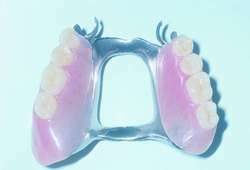 Kinds of partial dentures include articulated partial denture, bridgework, extension partial denture, fixed cantilever, fixed partial denture, removable partial denture, sectional denture, and unilateral denture. A dental prosthesis that restores one or more, but not all, of the natural teeth or associated parts and is supported by the teeth or the mucosa; it may be removable or fixed. A removable bridge that usually clasps onto only one abutment. 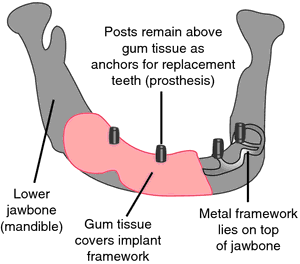 Dental prosthesis that restores one or more, but not all, natural teeth or associated parts and is supported by teeth or mucosa; may be removable or fixed; part of functional load carried by residual ridge. And restoring the lower jaw with partial telescope denture was the first treatment choice compared to fixed partial dentures. When compared to a conventional attachment, a semi precision attachment for a cast metal frame removable partial denture can perform a number of functions better. What many people don't know is that taking proper care of a partial denture is a big step to preserving a healthy smile. Our study findings were in contradiction to those of Ikebe et al, who found increase candidal activity in complete denture wearers as compared to the partial denture wearers 16. 1,2) Diagnosing ingested partial dentures may be difficult in a low resource setting where ignorance may be rife and diagnostic armamentarium scarce amongst patients and healthcare providers respectively. Tissue-colored porcelain on a fixed partial denture or acrylic resin augmentation on a removable partial denture may be used if the deficiency is minimal. He offers in-home denture and partial denture services including fittings, tooth replacement, repair and relines. Implants can replace one or more teeth, provide support for a partial denture, or be used to attach a full denture. Treatment options were reimplantation of avulsed tooth, no reimplantation, and prosthodontic replacement of tooth with removable partial denture, minimum preparation bridge, fixed partial denture, ortho-treatment, or implant placement at maturity. 84% (N=27) had the knowledge of Complete Denture, Removable Partial Denture, Fixed Partial denture and Implants respectively.